It is recommended that the day-to-day maintenance of exits and escape routes becomes the responsibility of all staff, contractors, visitors, residents and pupils. This is a way of ensuring that escape routes are kept free of all storage and obstructions. Other hazards to be aware of include moss and algae (which may be growing on paths), iceand uneven surfaces. Staff should know of the nearest escape routes. In larger building these may be indicated on standard Fire Notices. Snow build-up or ice formation on ramps or entrance ways pose a danger to vehicles, or can prevent access / egress. Similarly, snow or ice on paths or stairways create a pedestrian hazard. Access is often critical. Ramps serving car parks in hotels, shops and public buildings and business must be kept clear. Entrances to hospitals and similar establishments must be accessible at all times. Critical surfaces should be provided with a reliable automatic solution to the problem. Underfloor Heating isa perfect way to create warm comfort within Living areas such as Bathrooms, Kitchens, and Conservatories. This heating system is placed close to the floor surface and due to the even heat distribution upside you are getting the optimum heating climate in your room. All our Underfloor Heating systems nowadays are cost effective, reliable, and efficient and are an energy efficient method of keeping warm. •Automatic control systems detecting snow and ice formation. 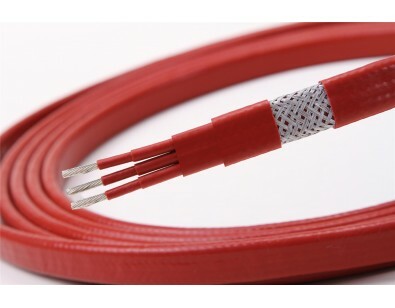 • Metallic braided sheath with minimum electric fields. • Operating temperature max +70°C.